The "Learn & Live" volunteers patrolled the streets of Jerusalem on Purim eve to offer assistance and guidance to the youth. 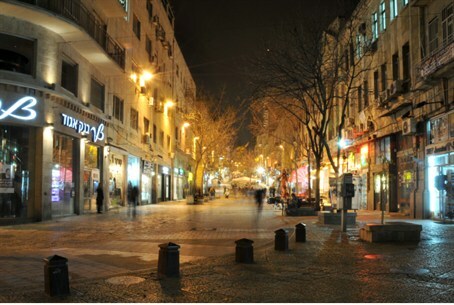 While most Israelis were spending the holiday night with their families and loved ones, a group of thirty volunteers spent the cold holiday night patrolling the streets of downtown Jerusalem offering assistance and guidance to the many young people out celebrating. Purim, which is known for being the "celebration" holiday, sees hundreds of youths converge year after year in the heart of Jerusalem, with alcohol and drugs in rampant use. Over the past few years there has been a steady increase in the numbers of Israeli youths – especially vulnerable young women and girls – who regularly fall "between the cracks" and find themselves in horrific situations. In fact, the number of at-risk youth in Israel has grown by 48% over the past decade. Some of these women even find themselves held against their will in villages over the Green Line after being lured there while under the influence of alcohol and drugs – or even emotionally attracted to the promise of stability they never found in their own home. According to an Israeli Knesset report, "there are 1071 children missing in Israel, most of which are young girls that were lured away with gifts by older men." Established in 2009, "Learn & Live", is a dynamic non-profit organization that focuses on helping the 330,000 Israeli youth who regularly find themselves on the streets, using drugs, and sometimes trapped in the terrible cycle of illegal, illicit activity, spearheads the annual communal outreach around the Purim holiday. Over the past three years, Learn and Live has helped over 3,000 girls who have found themselves in relationships against their will. "It is unfortunate, but all too often the police and law authorities in Israel believe that it is only their responsibility to assist young people if they are faced with outright physical violence," noted Patty Kupfer, Learn and Live's project coordinator for their Purim patrol. "We, on the other hand, believe that it is our obligation to step up and help these young women before they become just another sad statistic," Kupfer continued. Throughout the night, trained Learn and Live volunteers divided up into small groups and patrolled the streets, assisting young women who seemed to be headed for real trouble. The volunteers will took worst cases, including those who are obviously not in control or close to passing out – to one of two tents – one downtown where they are offered a safe place to rest and have a warm drink, and another one in Baka where they the night and then receive some breakfast and bus fare home in the morning. "I went out looking to have a good time with my friends," said Shira A, a 16 year-old Jerusalem high school student, "but as the night wore on I started to realized that I had partied too much and wasn't really fully in control anymore. I was so grateful when a kind woman appeared out of nowhere and helped find a place to get my bearings – and even some sleep – before heading home in the morning. It was really heartening to see those volunteers getting involved to stop problems before they occur."